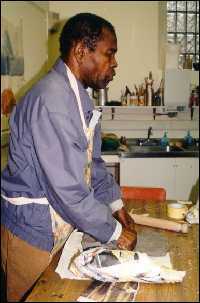 Art Through Touch is an organisation based in south London that develops and runs art projects with visually impaired and blind people. 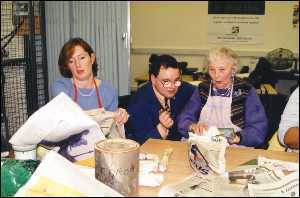 In November 1997 I led a workshop to create a tactile mural with 8 people from the group. This piece in terracotta clay was called a 'Language of Touch'. 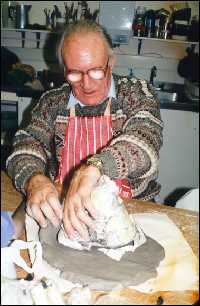 To coincide with its exhibition at the St George's Hospital Tooting I was invited to lead a follow up session in 1998. The daylong session comprised two parts, a discussion and a workshop. At the exhibition we discussed the mural created in the previous workshop, concentrating on the results of making sculpture by touch and tactile mark making. In particular we debated how our work in plastic clay had come through the firing process. We also considered the design qualities of tactile mark making as an independent art form. The theme of the workshop was making marks in objects that make it possible to comfortably hold that object.